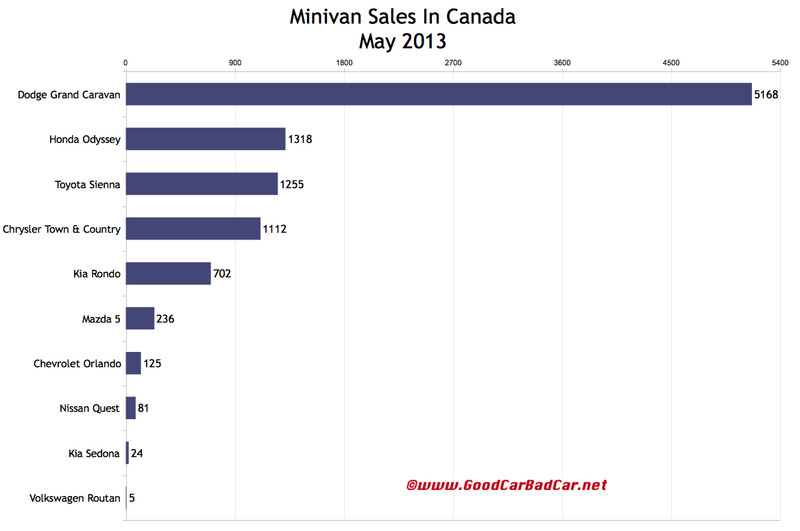 Minivan sales in Canada rose slightly, just a bit better than 1%, in May 2013. 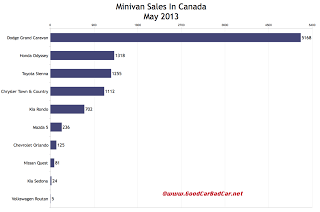 Dragged down by the disappearance of the Volkswagen Routan, fast-falling Mazda 5 volume, and plunging Chevrolet Orlando sales, the overall totals belie the results achieved by Canada’s two-best-selling minivans. Dodge Grand Caravan sales perked up slightly in May. Together with the Chrysler Town & Country, the Windsor-built vans owned 63% of the market in May, down from 65% in April. Meanwhile, the Honda Odyssey recorded a 45% year-over-year increase in May. Through five months, the Odyssey trails the Toyota Sienna by 561 units for a distant second place in the category. You can click any model name in the tables below to find historical monthly and yearly Canadian sales data. You can also select a make and model at GCBC’s Sales Stats page. These tables are now sortable, so you can rank minivans any which way you like. Suggestions on how GCBC should break down segments can be passed on through the Contact page.